Each dog breed is different, and that makes it just as much fun! From Great Dane to Chihuahua, each breed has its own charm. 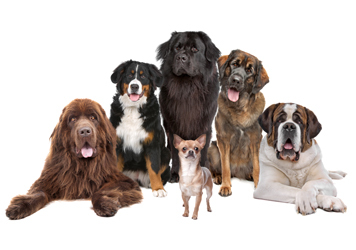 At Vetsend we would like to inform you about the characteristics of the most popular dog breeds. For each breed of dog, you will find the physical features, common symptoms, best approach for training and which owners this breed fits best. Which dog breeds are suitable for you? Do you want to buy a new dog, but have no idea which breed suits you best? Then take a look at the characteristics of each breed. The Malinois Shepherd is a real watchdog and the Border Collie a dog that can excel in dog sports. The size of a dog is also an important point in the selection process. If you don't have a lot of space, it's better to choose a smaller dog breed. Do you have a large house with a big garden? In that case you can also choose a larger dog breed. It is also useful to see how much time you have available to take care of your dog. A long-haired dog breed needs much more maintenance than a short-haired breed. By orienting yourself properly on various breeds, you can ultimately make a better choice and choose a dog that really suits you and your family! Would you like to participate in shows together or practice a sport together? Each breed of dog has its own speciality! The Beagle is really suitable for hunting and the Chihuahua for dog shows. An all-rounder is the German Shepherd. This dog can be used for a lot of dog sports, such as flyball, agility, obedience and tracking.